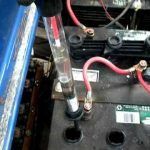 Proper Watering and Charging of Electric Golf Cart Batteries. McCulley's Golf Cars > Blog > Maintenance > Proper Watering and Charging of Electric Golf Cart Batteries. You should always check your electric golf cart batteries after the charging process has been completed, never put water in your batteries before charging. Why? Well, you do this to keep the batteries from boiling excess electrolytes out of the batteries while charging. If the water level is below the lead plates then you will want to add water. There is a specific kind you have to use in this process, regular tap water from your home or business will not work. You can only use distilled water, demineralized water, or deionized water. The reason for this is regular tap water can produce calcium or magnesium sulfate crystals that can fill the pores and coat the plates in your batteries which will reduce your electric golf carts batteries’ life. When you do put the water in you only want to fill approximately ¼” above the plates. It’s very important that all battery cells be filled properly to maintain a good battery life. Remember to always check your batteries water levels at least once a month or more depending on how often you charge the battery. Before charging make sure that the batteries are clean and dry, if they are wet then your batteries have most likely been over-watered. Some golf cart owners believe that you shouldn’t charge your batteries often, this is NOT true, you should always charge the battery even if the golf cart was used only for a short period of time (9 holes or 10 minutes). 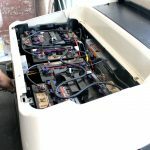 Before plugging in your electric golf cart battery charger you should always inspect all your battery cables for frays and/or corrosion and make sure all of your battery terminals are cleaned and on tight. If the terminal connection is corroded it can cause your voltage to drop between batteries and lessen your golf carts battery life. It can also cause the cable to fail due to heat caused by high resistance. If this happens you will want to replace any corroded cables with new ones, then make sure you apply a good coating of terminal protector after cleaning and before charging. Corrosion will prevent your batteries from properly charging and operating. You’ll want to check and make sure all of your vent caps are on securely, Make sure the ignition is in the OFF position. It is best to use an automatic charger that will shut itself off when the battery is fully charged. Do not discharge your battery more than 80%, you are more likely to over discharge than overcharge your battery. Remember a well cared for battery will give you years of nice worry free service.